Noodle dishes are always served during birthdays and Chinese New Year because the Chinese believe they symbolize good fortune, prosperity, and longevity. The longer the noodles, the longer (and luckier) your life will be — so don’t cut them! This dish is made with long, flat egg noodles called e-fu noodles; if you can’t find them, substitute with linguine (preferably fresh). 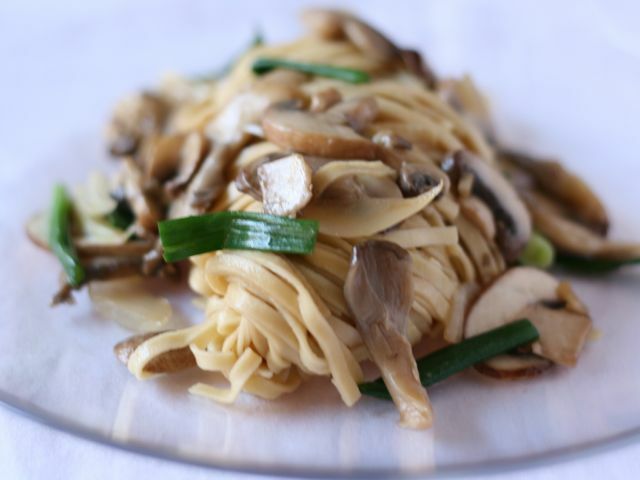 Studded with three different kinds of mushrooms (feel free to use any of your favorites) and Chinese chives, the noodles in this dish are not as dry as fried chow mein, but lightly coated with sauce. Prepare the noodles according to the package directions. Tip into a colander over the sink and rinse under cold running water. Place the noodles in a large bowl. Sprinkle with 1 tablespoon oil, the soy sauce, and a pinch of salt. Toss and set aside. Preheat a large wok or skillet over medium-high heat for 1 minute. Swirl in the remaining oil and heat until it becomes runny and starts to shimmer. Stir in the garlic and shallots and cook until fragrant, 30 to 45 seconds. Toss in the black mushrooms and button mushrooms and cook and stir until the mushrooms are almost cooked, 2 minutes. Add the enoki mushrooms followed by the reserved mushroom liquid. Sprinkle with the oyster sauce and 1 teaspoon salt. Add the chives followed by the noodles. Stir everything swiftly around the wok until well mixed and heated through (use a spatula in each hand to evenly toss the noodles if necessary). Season with salt and pepper to taste and toss with a couple more flourishes. Serve hot. Enoki mushrooms have a mild but delightful flavor and a pleasantly crunchy texture. Cut off and discard the bottom of the cluster of mushrooms (up to the point where the individual mushroom stems separate). No washing is necessary. The stems are generally left long.